Obituary – Powers, Mary Elizabeth (Lindeman) « Perry High School Alumni Association, Inc.
– born on October 16, 1917, she is the daughter of Mr. and Mrs. F. W. Lindeman. She attended St. Joseph’s Academy and the Perry schools. While a student of the Perry schools she was a member of the Red Hots. Following graduation she expects to take up nurses training. Mrs. Mary Elizabeth Powers, 60, a resident of Progressive apartments, former Noble county treasurer, died at 6:30 a.m. Wednesday at Mercy hospital in Oklahoma City. Rosary will be at 7:30 p.m. Friday at the Parker chapel. Funeral mass will be at 10 a.m. Saturday at St. Rose of Lima Catholic church. In charge will be Rev. Ward J. Pankratz, pastor of the Catholic church. Burial will be in the Catholic cemetery. Mrs. Powers had been in failing health several weeks and was hospitalized last month. She was born Oct. 16, 1917, in Perry and graduated in 1936 from Perry high school. She attended the St. Anthony’s school of nursing in Oklahoma City. Mrs. Powers was married April 19, 1940, in Perry to Bob Powers, who preceded her in death in May, 1973. 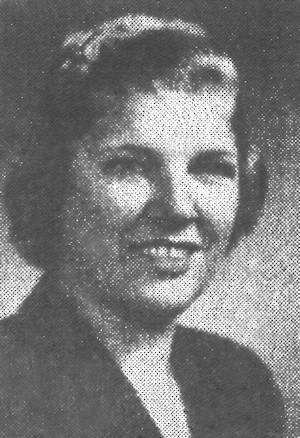 She first began work in the courthouse as a deputy county treasurer March 1, 1947., She became Noble county treasurer July 1, 1963 and held that post until July 1, 1975. She was a member of St. Rose of Lima Catholic church and had been active in the Noble County Democrat Women’s club. Survivors include her mother, Mrs. Carrie Lindeman, Perry; three sisters, Mrs. Bob (Lucile) Craft and Mrs. George (Ruth) Queen, both of Perry, and Mrs. Orville (Philomene) Hardin, Houston, Texas; and seven nieces and nephews.